A seminal work of Modernist architecture, Lever House redefined not only Park Avenue and corporate architecture, but also much of urban planning. This "small" building, by midtown Manhattan standards, not only forswore utilizing its maximum buildable size, but it also sacrificed its extremely valuable ground-floor space for public purposes. While its catty-corner neighbor, the Seagram Building, was widely credited a few years later with spurring the movement for plazas, Lever House actually was the real pioneer. Its design appears to be a paradigm of clean lines and simplicity, but in reality it is quite sophisticated. A tower slab placed near the north end of the site "floats" above a "floating" platform raised on stilts, or pilotis. A large rectangular well is cut into the platform to create an open courtyard. An employee terrace overlooks the lushly landscaped courtyard whose large planting area is surrounded by a continuous seating wall. Stainless-steel columns support the platform and tower and all of the lobby, which is only under the tower portion of the site, except the elevator-bank section, is glass enclosed. The remainder of the ground-floor space is open and serves as an arcade, probably the city's widest on both the avenue and the 53rd Street portion of the site. The open street-level areas, shown below, beneath the floating platform are rather dark and unexciting and could use some color, lighting and perhaps a lot of ivy. Sometimes a corporate tenant or owner can be too civic-minded and Lever House's policy of holding exhibitions of children's art and the like in its glass-enclosed lobby over the years has detracted considerably from the original design. The exhibition panels partially obstruct the planned open vistas and minimize the "floating" intention of the platform design. Thankfully, such installations are temporary. The "squeaky clean" cool green glass and stainless steel facades of Lever House are appropriate for the headquarters of a soapmaker and in sharp and definitive contrast to its neighbors and superbly mark and highlight a new architectural generation. The building almost ended up in Chicago. "In the mid-1940’s, Nathaniel Owings of the firm Skidmore, Owings & Merrill (SOM), had prepared for Lever’s management a sketch model of a slab-like scheme for a site opposite Chicago’s Drake Hotel; and in 1949 SOM’s Charles D. Wiley had prepared a design for a downtown Chicago site that consisted of a slab on pilotis locked into a low mezzanine that wrapped around a small open-air courtyard. But Lever Brothers decided to build their headquarters in New York rather than Chicago because, as a company representative stated, ‘The price one pays for soap is 89 percent advertising...and the advertising agencies of American were there." Gordon Bunshaft ended up becoming the SOM architect in charge for this project for Lever Bros., whose chief executive officer at the time of the company acquired the site was Charles Luckman, who left the company to return to his architectural practice. He formerly had been a partner of William Pereira. According to Stern, Mellins and Fishman, "Lever House was not...the first postwar proposal for a building that would break dramatically with the street wall on Park Avenue." They cited a design by Harrison, Abramovitz & Wiggins for the Alcoa Company called for "a complexly massed stepped slab office building to occupy the southeast corner of Park Avenue and Fifty-Eighth Street, where it would replace a fourteen-story apartment house, 471 Park Avenue, designed by Charles W. Buckham in 1908." The design, they continued, called for three slab-like "elements of different heights, combined to form a U-shaped structure that enclosed a second-level open-air terrace facing Park Avenue," adding, however, that the plan did not advance and the apartment house was subsequently stripped of its facades by Charles N. and Selig Whinston and reskinned in white brick" in 1958. The building, which introduced window-washing gondolas, was widely admired, but, not surprisingly, there were some dissents. Aline Loucheim regretted that a garden design by Isamu Noguchi had been abandoned and argued that the rectilinearity needed some relief and others said it was a little lifeless. "That first of the modern skyscrapers on the thoroughfare elegantly set the type for the famous American screen, or curtain wall, of the 1950’s. Or perhaps the somewhat less elegant Secretariat of the United Nations was more typical; the whole group was a weakly achieved linearization of a sketch by Le Corbusier. The screen itself had a typically American ancestry and growth: a European original in Le Corbusier’s pans de verre of the 1920’s, made slicker, thinner, and more obsessively linear in the traditional American manner. Lever House was also a typical Bauhaus object: freestanding, shiny, weightless, asymmetrical, and fundamentally non-urban. It both cut the first serious hole in Park Avenue as a street and created an unusable plaza of its own. The Seagram building, on the other hand, although it, too, clearly wanted to be free-standing in the ville radieuse rather than on a street, was not unwilling both to assume a firm cross-axis with the avenue, so creating a fine entrance plaza, and to stretch its own slab laterally with the movement of the avenue rather than against, as Lever had done." What about St. Bartholomew’s Church not holding the streetline on the avenue, Vincent? Balderdash! Lever House’s base specifically holds the streetline as does the edge of the tower! Some critics just don’t get it, or just hate something "modern"! "With the building’s completion the thirty-year-old utopistic ideas of Mies van der Rohe and Le Corbusier were at last realized at full scale. No longer an art of solid and void, of mass displacing and defining space, architecture was now a play of light and shadow on glass, an art of literal transparency and surface reflectivity. The construction of Lever House marked not only the fulfillment of an architectural but also an urbanistic vision: with the building slab lifted on a base and turned at a right angle to the grand axis of Park Avenue, the traditional street - the rue corridor so loathed by Le Corbusier - was no longer an exalted standard. The old order of the ensemble was replaced by a new urban order of individual, object-like buildings ‘liberated’ in space and set apart from one another." It is true that Park Avenue should not have been tampered with after World War II and turned into a very legitimate, for a change, historic district. It was not, unfortunately. One can fault Lever House for spurning Noguchi and not maximizing their real estate development with a bigger building and for patronizing an architectural revolution. Park Avenue was well known before Lever House...as a pleasant place to stay or live, not as the business pinnacle of the world, a contribution made completely by Lever House, a contribution that led to the sustained growth and fantastic redevelopment of midtown Manhattan. In retrospect, it is both a basic question of planning and a basic question of economics. Do you have governmental design review and direct all new development to areas less than perfect, nay, attractive for the sake of historic preservation, hoping that the marketplace will follow such direction? Or, do you minimize interference with property rights and let the city developer helter-skelter, chaotic, pretty much as it has? On the other hand, does the dawning of a corporate headquarters haven, or the promise of it and all its allegedly attendant wealth and taxes, justify tampering with a fairly consistent and fairly attractive street wall of fairly decent buildings. Don’t mess with mother Park Avenue, some might have said. Don’t mess with lesser architects, other s might retort. Common sense sometimes prevails. Lever House’s glassiness became one of the most copied works of art in the history of architecture. The 24-story tower has had problems replacing its green-glass curtain wall over the years, but the project remains a monument to urban civility and elegance. 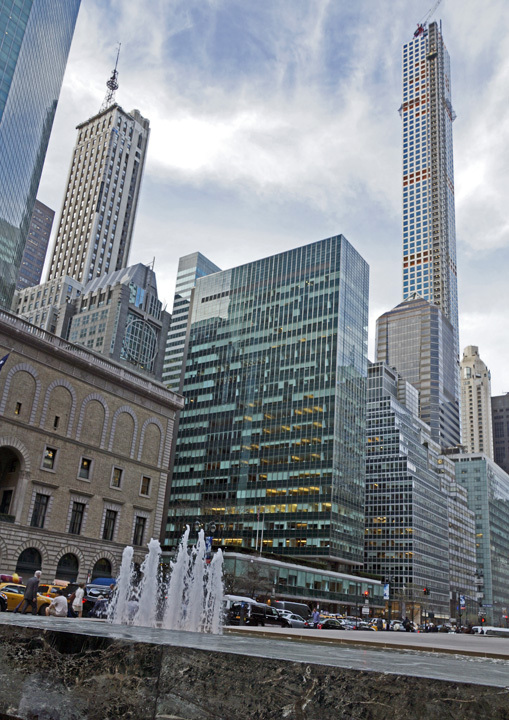 In 1990, a Spanish bank erected the very handsome tower directly west of the site, greatly enhancing the ambiance of the courtyard and terrace and the overall setting of Lever House. A few years before, the Park Avenue Plaza office tower, also by S.O.M., directly across 53rd Street and behind the Racquet & Tennis Club fronting on the avenue paid fine homage to Lever House with its crisply detailed cool green curtain wall. For a manufacturer of soap, the building's glistening headquarters was appropriately "squeaky-clean" architecture. In 2005, Aby Rosen, the owner of the building, opened a new, elegant restaurant on the ground floor on East 53rd Street.